Traditional Entertainment in Bangkok hasn't stopped flourishing throughout the whole of the kingdom even though the city of angels has adopted many modern trends. The graceful movements of classical dance-drama have survived the test of time, mainly because many of us still hold a fascination for the local folklore in these parts of Southeast Asia. And for good reason too. It's a city full of electricity and excitement. High-spirited Sanuk (fun) you shall soon notice, is an all-embracing activity even on the most serious of occasions such as those at religious festivals. Grassroots following of typical obsessions such as Muay Thai Boxing, will no doubt remain as strong as ever. When you can truly satisfy your curiosity for the local passions, you essentially get to better understand the real meaning of life in Thailand. Whether it's a song filled night out in a beer bar or a folk music club, a friendly game of takraw, a temple fair outing, a traditional Thai dance, a classical drama concert, a ladyboy cabaret show, a delightful puppet performance or the latest Thai movie, Bangkok has it all and more. Just go out there and grab your slice. Apart from this entertainment guide I have also prepared a guide to some of the very best Performing Arts Theatres in which to experience Khon masked dance drama, traditional and modern Thai dance and some great puppet performances. You have not experienced any real entertainment in Bangkok if you have not yet been to a least one of the ever popular transvestite cabaret shows. As with any performance of this nature, the Calypso Cabaret Show at the Asia Hotel on Phaya Thai Road near Siam Square is one such show you should not miss. If you are in little doubt as to what to expect, you are sure to be pleasantly surprised. The show involves a cast of glamorous transsexuals known to most westerners as lady boys (a male-to-female transgender person) but also known locally as katoeys, who perform modern dance in lavish costumes while lip-synching to pop songs. There are two shows here nightly at 8:15 pm and 9:45 pm respectfully. Bangkok's Broadway-like cabaret shows will leave you spellbound! On this tour, you'll be taken to the Calypso Theatre for a one-hour extravaganza that's completely unique, featuring the best of Thailand’s transgender artists and performers on a live stage. You’ll be dazzled by the stunning costumes from sequined gowns to burlesque corsets as well as the talents of the beautiful dancers, singers and entertainers in these energetic performances. Included in the admission ticket is a round-trip hotel transport. A must see cultural extravaganza performed on one of the largest stages in the world is Siam Niramit set in the heart of Bangkok at the Ratchada Theatre at 19 Thiam Ruammit Road. Access to the venue can be gained via several of the major thoroughfares in the city or by taking the MRT underground subway. Siam Niramit is a world-class production featuring well over 150 performers with as many as 500 costume changes and lots of special effects that will take you on a spectacular journey to the enchanted Kingdom of Thailand. The performances here depict Thailand's arts and cultural heritage and are specifically designed to entertain foreign tourists. They present an idealised vision of ancient Siam using hi-tech special effects, thus creating a realistic and awe-inspiring experience. Booking your shows here (at no extra cost to you) will not only allow me to earn a small commission but you'd be helping me maintain this blog so that I can continue giving you more Thailand travel info. Other forms of great entertainment in Bangkok include the various types of Thai dance and martial art demonstrations. One of the nicest places in the city for this is perhaps at Silom Village on Silom Road. Accompanying the indoor show is a set menu and if the standard of the performances is anything to go by, the food served here is on equal par. This has to be an excellent choice as far as a wonderfully entertaining evening. Dinner is served between 8:00 pm and 9:15 pm. 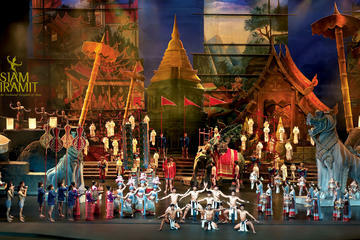 Thailand Cultural Centre is the main performing arts venue in Bangkok and attracts a whole host of international artists. The centre which was a gift of the government of Japan is located on Ratchadapisek Road north of central Bangkok. Here you'll find three stages that present all sorts of acts ranging from puppets to pianists and everything else in between. The facility is host to some spectacular shows including the annual international festival of modern dance and music. International artists often perform here during world tours. The centre is also home to Bangkok's Symphony Orchestra. Muay Thai or Thai Boxing is well worth an evening of entertainment in Bangkok and two places you get to see this is at the Lumpinee Boxing Stadium, located within an easy walking distance from Lumphini Park and at the somewhat spacious Ratchadamnoen Boxing Stadium on Ratchadamnoen Nok Road. Muay Thai is Thailand's national sport and the exciting part is to watch the contestants punch and kick the S.H.I.T. out of each other with their fists, feet, elbows and knees. It's kinda like a scene out of the fight club, only before the fight begins, contestants do a rather bizarre dance called Ram Muay which is then accompanied by excited Thai spectators wailing instruments. Games are held throughout the week, alternating between both these stadiums. Ratchadamnoen Stadium tends to boast the best bouts and is usually held on a Thursday evening. They are also open on Mondays, Wednesdays and Sundays. An evening's entertainment includes ten games of five rounds each lasting five minutes per round. The atmosphere near the ring can justifiably be compared to that of the New York Stock Exchange simply because hundreds of electrically charged Thai spectators frantically wave their hands in the air while running up and down the aisles trying to convey bets and ratings to an excited crowd.